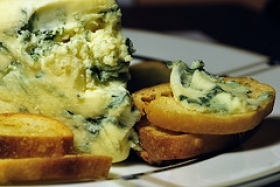 Have you made Asparagus with Blue Cheese? 1. 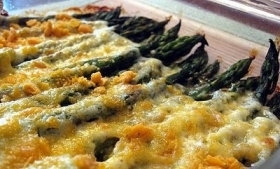 Snap ends off asparagus spears. 2. Fill medium skillet with 1-inch water and bring to a boil. 3. 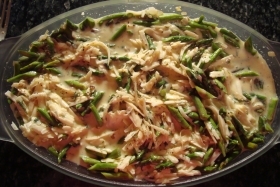 Add asparagus in single layer and cook 8 to 10 minutes or until tender. 4. Drain well and arrange on a serving plate. Stir together vinegar and oil in sm bowl. 5. 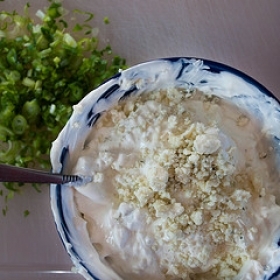 Add blue cheese and chives and mix well. Pour over hot asparagus. 6. Season to taste with plenty of white pepper. 7. Set aside until tepid, then serve. 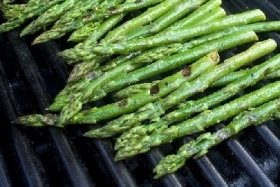 Hint on cleaning asparagus: Hold the bottom end of the stem in one hand and gently bend the stalk with the other. 8. 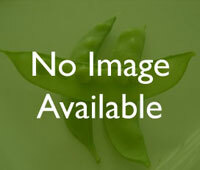 The stalk will break where it is tender, thus giving you a piece of asparagus that is entirely edible. 9. With a little practice you will know exactly where to break the vegetable. 10. Save the broken-off ends for soups. Slice and add to soup stock, then drain and discard the coarse stalks before serving. 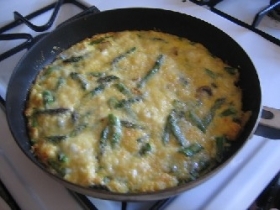 This recipe contains potential food allergens and will effect people with Cheese, Asparagus, Sulfites, Vinegar, Olive Oil allergies.